(CNN) -- Growing up in America, Joshu Harris was captivated by the mystique, music and history of Cuba. 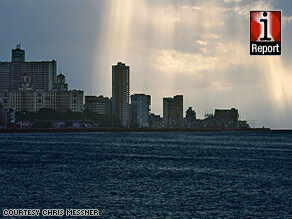 A photograph of Havana at dusk taken by photographer Chris Messner on his second trip to Cuba in April 2008. So before Harris started law school, he traveled to Santiago in southeastern Cuba -- something very few Americans can do today. While there, he played his trumpet with a local dance band, touring across the Cuban countryside. "I wanted to see and experience the country for myself," says Harris, who is now an attorney in Philadelphia, Pennsylvania. Harris visited Cuba in 2004 under the promise that he would stay with a Cuban friend and host. Such travel was legal at the time -- before former President George W. Bush imposed more stringent travel restrictions later that year. Many travelers and travel industry professionals hope the Obama administration will soon loosen Cuba travel rules. During the campaign for the White House, President Obama promised to lift travel restrictions on Cuban Americans trying to visit family. "My daughter still hasn't met her grandmother," said Leigh Salvage, a 38-year-old teacher in Amherst, Massachusetts. Salvage, who is not Cuban, hopes to accompany her Cuban boyfriend and their 2-year-old daughter soon to visit his relatives in Cuba. She volunteered for the Obama campaign last year, telling people about the effect of the travel restrictions on her family. "We have roots there, and we should be able to go without so much trouble," she said. In 2007, about 45,200 Americans -- including Cuban Americans -- legally obtained a license or approval from the U.S. government to enter Cuba by air, a dramatic drop from nearly 84,500 travelers in 2003, according to reports from the U.S. Department of Commerce's Office of Travel and Tourism Industries. Easing travel restrictions for Cuban Americans alone isn't enough for many in the travel industry. The American Society of Travel Agents, the nation's largest group of travel professionals and companies, would like all Americans to be allowed to visit the island. The group formally requested the Obama administration lift all travel restrictions. American travel to Cuba remains tightly controlled and highly bureaucratic for most Americans since the U.S. imposed a trade embargo on the country in the 1960s. Many American critics say opening U.S. travel to Cuba would be supporting an oppressive, totalitarian government. Several academics say Obama's administration wouldn't go as far as allowing American leisure travel, and the president indicated he will maintain the trade embargo. "The Obama administration isn't just going to give the policy unless Cuba gives something in return," says Jaime Suchlicki, director of the Institute for Cuban and Cuban American Studies at the University of Miami. Almost all other countries in the world have open access to Cuba and the island remains a popular tourist destination for Canadians and Europeans, attracting millions of visitors each year. Tourism is a primary source of revenue for the island. Along with Cuban Americans, journalists, church volunteers, athletes and students are among the few non-Cuban Americans who can apply for applications to visit Cuba. "Travel isn't banned," explains Richard Champley, a senior analyst in the U.S. Department of Commerce's Office of Travel and Tourism and Industries, "You just have to get permission." Legal American travel to Cuba began to fall after Bush toughened restrictions. For example, there were nearly 350 universities and schools offering study abroad programs before the changes. Now, there are only a half dozen, says Robert Bozina, a professor at Santa Clara University in California who organizes the school's Cuba study abroad trip. Government approved travelers usually enter Cuba via charter flights because direct flights by U.S. flagged carriers are illegal. Flights from Miami, Florida, located 90 miles away, can run around $550 for a round trip, according to several charter companies. Other Americans who visit Cuba illegally rely on foreign entry points such as the Cayman Islands, Mexico City or Canada. Travel experts estimate tens of thousands of Americans do this annually, despite the fact that tourist travel to Cuba is also illegal through a third party country, according to the U.S. State Department. Travelers who visit the country illegally "could face civil penalties and criminal prosecution upon the return to the United States," the State Department's Web site says. Civil penalties could mean thousands of dollars in mandatory fines. Despite restrictions, travel industry professionals say the American tourist demand is there. "If Cuba was opened up, you'd see a significant amount of interest from Americans," says Mary Peremsky, a travel consultant at Travel Advisors International, a travel booking agency based in Minnesota. "People get tired of the same cookie cutter destinations." A travel agent for more than 20 years, Peremsky says visiting Cuba would be a big hit for younger and more adventurous travelers with an appetite for unexplored locations. The close proximity of Cuba to the U.S. makes the Caribbean island a convenient destination as well. Chris Messner, a fine arts photographer in Santa Barbara, California, visited Cuba twice in the last three years through his association with the Architectural Design Review Board. "Everything is like a time capsule," said Messner, who plans to return in March. "When you are in Havana, it's like you're in the 1950s." If leisure travel is approved, legal tourism to Cuba will only be popular among Americans in the first few years, says Tomas Bilbao, executive director at Cuba Study Group in Washington. He says U.S. tourists are unlikely to return once they realize the island's weak infrastructure grants limited services at a higher cost compared to other Caribbean destinations. Still, travel agents are ready to meet the demand for Cuba travel. "I think Cuba needs some work, and I don't know if it's ready for us," says Cathy Mezzacappa, manager of Marshfield Travel, a travel company outside of Boston, Massachusetts. "But we're ready for them."